InSight will investigate the interior structure and composition of Mars to uncover how a rocky body forms and evolves to become a planet. 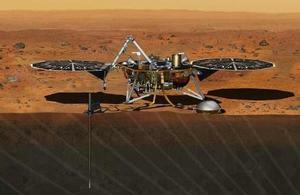 Artist's impression of InSight. Credit: NASA. InSight is a NASA robotic mission which successfully landed on Mars at 19:53 GMT on 26 November 2018. It will take about 10 weeks to fully deploy the science and start taking data. These will measure Mars’ seismic activity, the amount of heat flow from the interior, the size and physical state of Mars’s core, and determine the size of Mars’ iron-rich core and whether it is liquid. The Seismic Experiment for Interior Structure (SEIS) is led by France in partnership with the UK, Germany and Switzerland. The UK is providing the short period seismometer (SEIS-SP) element of the instrument. The seismic activity package will assess the deep interior structure of Mars. This includes the capturing of signals from marsquakes, meteorite impacts, and even the tidal forces by Mars’ moon Phobos. The UK Space Agency is funding Imperial College London, University of Oxford and the Rutherford Appleton Laboratory to develop 3 Short-Period sensors (SEIS-SP) and the associated electronics including the feedback board. SEIS-SP and its electronics will be integrated into the full SEIS package. 27 November 2018 Update to say that the mission successfully landed on Mars. 25 October 2017 Page content updated. 13 March 2015 First published.